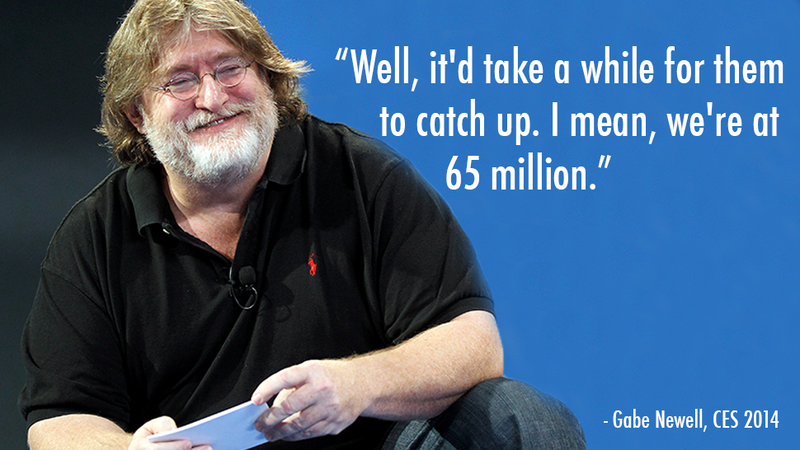 Sitting at Valve's CES conference in Las Vegas today, one inquisitive audience member couldn't help but ask...is Valve worried about keeping up with Microsoft's momentum, having just announced 3 million units already sold? Question from the audience at a Valve CES presentation: Microsoft just announced 3 million units of xbox one were sold at launch for the last three months, can you hit that target by the end of the year? Can you do 3 million units? Newell: Well, it'd take a while for them to catch up. I mean, we're at 65 million. Part of why we think that this is the right direction to go in is that we can benefit from everything that people have already done. If I buy a game on Steam and am running it on Windows, I can go to one of the Steam Machines and I already have the game. So the benefit as a developer, you benefit as a consumer, having that PC experience extended into the living room.